Ten Ren's Second Grade Pouchong consists of fine quality and tender tea leaves from northern Taiwan. Pouchong along with Tung-Ting Oolong are among Taiwan's famous teas. Pouchong tea originated in Taiwan. 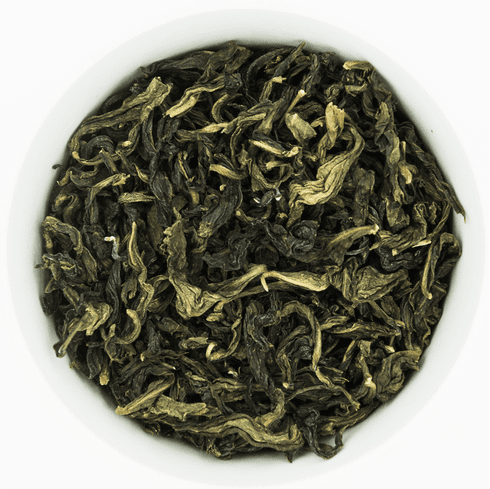 The steeped tea from Ten Ren's Second Grade Pouchong has a light green-yellow hue and faint mild flora aroma. The taste is mildly floral and sweet. The aftertaste of this tea is a fresh clean sweetness which lasts after the sip. The water used to steep this tea should be about 175�F or 80�C. Use about 1.5 tablespoons (3 grams) of tea leaves for about every 5 ounces (150 mL) of water. A steeping time of about 3-5 minutes is recommended with more or less time depending on the desired concentration. As a rough guide, the higher the temperature of the water or the greater the amount of leaves used, the shorter the steeping time should be. For the ultimate enjoyment, a traditional Chinese Yixing teapot is recommended for loose Pouchong tea. The teapot should be half filled with leaves and initially steeped for 45 seconds to 1 minute with the steeping time increased by an additional 15 seconds for each successive steeping. The leaves may be steeped multiple times.